Yes, this review has taken me wayyyyyyy more than the stipulated time. I am sure, however, that every one who has read this book would understand that this is NOT a book to be hurried with! It is meant to be savoured and soaked in. So with due apologies, I think I am justified in having lived with the book for my own sweet time. The protagonists demanded that I did! The style and pace wanted me to engage myself in it! The author definitely wanted me to stroll over the words and take in with refreshing sight, those fantabulous illustrations! I generally don't like reading about animals. I am not a pet crazy girl. I like pets but from a distance, having been brought up with the fear of animals and never had a pet myself. Over time, I have come to an extent where I will 'oww' and pet a dog or cat, but not to the level that I'd kiss them or let them lick me silly. I had my apprehensions when I began reading this book as animal fiction has not enthralled me, with the sole exception of the Jungle Book. Where James Herriet failed, Nilanjana Roy easily had me floored! The style of writing is so engaging. The story is about a wild bunch of cats living in the Nizamuddin area of Old Delhi. Their lives, fears, interactions are all elaborated in a carefully careless manner, such that you get involved with them as if they were your own, but at the same time not find it tedious. Special credit must be given to Nilanjana Roy for the same. Not always can a writer tuck in as many details without making the reader feel it getting laborious! Holding on to the feline charm, yet making it possible for us to relate to the motions and characteristics of being alive, Nilanjana sculpts the cat world of Beraal, Mara, Miao, Katar, Hulo, Southpaw and others with charm and control. The outline is right there on the blurb and the story is a ‘google’ away! So I am not going to give away the story; hence, you may breathe and read on. What particularly charmed me were the absolutely detailed illustrations. They were stylish, quirky, part realistic, part abstract and mostly as much a fabric of the overall story as the words themselves. A perfect jugalbandhi of talent between Nilanjana Roy and Prabha Mallya. The interaction between predator and prey, friendship amongst equals, trusting the unknown, bravery etc are beautifully and thankfully, non-preachily etched out through the many incidents in the book. I have always found cats strangely similar to humans in their behaviour. And hence, I have had an overall neutral and specifically affectionate reaction to cats. This book, however, will make you love cats, if you did not already. You will crave to have a furry thing to purr around you! Also you will wonder how you never noticed these things about the felines so far! Nilanjana pretty much infects you with her own obsession for the furred beings. Pick this book if you want to read a refreshing tale told in an absorbing manner, juxtaposed with imagery that would only go to make the tale that unfolds even more gripping than ever. But don’t hurry up your reading. Live with Mara, travel like a Sender through the book’s world when you are not reading it and yet are thinking about it, savour the nuanced descriptions of the climate changes, ponder over the societal demarcations in the animal world and astound over its similarities, enjoy the innocence as well as the ruthlessness of their lives and celebrate this book that is sure to demand a re-read from you. It is one of those rare books, so singular, so unique and absolutely enjoyable that will always proudly hold its fort on your book shelf. Lovely review! I liked this book too. And I agree on all the aspects you talked about. 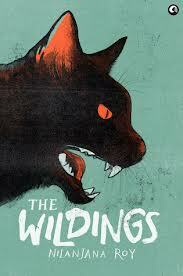 Wonderfully written with well defined characters (yes, yes those adorable cats! Southpaw! :D ) and fantastic illustrations!